Offering you a complete choice of products which include mattress drying system, dryer, aluminium oil cooler and heating and drying system. If you require PU Form / rubber form mattress drying machine for please specify following. 1. The capacity of PU Form / rubber form mattress drying machine in size of mattress and thickness of mattress and number of mattress. 4. Which material you want to dry, Size of mattress and weight of mattress? 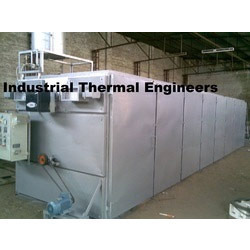 Industrial thermal engineers’ drying Systems are working in more than 200 Factories in India as well as abroad. We are manufacturing drying system Since 1979 and since then we have created trust with operators and manufacturers. The concept of Global quality pursued by constant research for the most reliable materials, simple and precise drive and control electronic system for drying cycle with personalized programs, manufacturers top level standard as for production and quality as well as reproducible results having consistent quality. Equipment for drying machine are made out of best quality of material like MS steel Sections. Heat transfer grade steel tube fin tubes type heavy duty heat exchangers suitable to use steam, Thermic Fluid Oil system, hot or superheated water system, diesel fired and gas fired burners. The Main components For Drying system are..
• All the parts and component of plants in special version are planned and manufactured to work at high temp. If you require drying machine for please specify following. 1. The capacity of drying machine in size of mattress and thickness of mattress and number of mattress. 4. Which material you want to dry, Size of material and weight of material before drying and after drying the same material? Equipment for drying machines are made out of best quality of material like MS steel Sections. Heat transfer grade steel tube fin tubes type heavy duty heat exchangers suitable to use steam, Thermic Fluid Oil system, hot or superheated water system, hot air, diesel fired and gas fired burners. 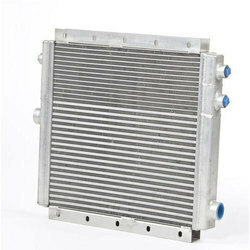 We manufacture and export a wide range of precision engineered Aluminum Oil Cooler, which are basically used for oil cooling. Mostly an automatic transmissions are equipped with an oil cooler, which is basically located inside the radiator. Our range of oil coolers usually runs close to 200 degrees, which increases the durability as well as efficiency of the machine. In order to cater the precise requirements of our clients, we are offering a wide assortment of Heating and Drying System; offered products are provided in different grades in accordance to the needs of our customers. Skilled professionals manufactured these products by taking high grade components in compliance with set quality standards. Type of construction of drying and heating system. 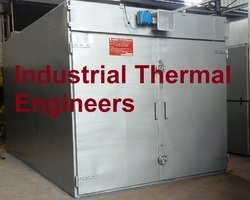 Temperature requirement for drying and heating system. Looking for Heating And Drying Systems ?